Add refill for only $1.99 when keychain pepper spray is purchased. See dropdown menu to order color of holder. Compare to pepper shot or pepper bloc. There is no comparison. This is a much better formula for less money. This spray is just as hot as bear spray! It has the same capsaicin content as the leading bear spray, guaranteed! We have the best price for keychain pepper spray, too. We buy right from the factory and pass the savings on to you. Very convenient pepper spray keyring holster to carry in pocket, car or purse. 1/2 oz. 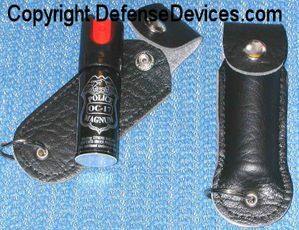 of pepper spray shoots a range of 8-10 feet for about 12 half-second sprays. (I've actually gotten more in my own testing) Twist lock top to prevent accidents. Keychain holster is a very nice leatherette case that looks just like leather. Now available in colors: yellow, red, as well as black. See dropdown menu for choices. We cannot ship Police Magnum pepper spray to NY, WI, HI, AK,or APO addresses. Pepper spray cannot be shipped by air.